Do you like it? Hmm…I loved it at first. But then it became a little too Shabby Chic for me. If I were to do this again I wouldn’t make the knots visible. But that’s my style, I prefer clean lines. I loved mixing in a splash of colorful fabric though, it’s a great way to tie in (pun!) an accent color. 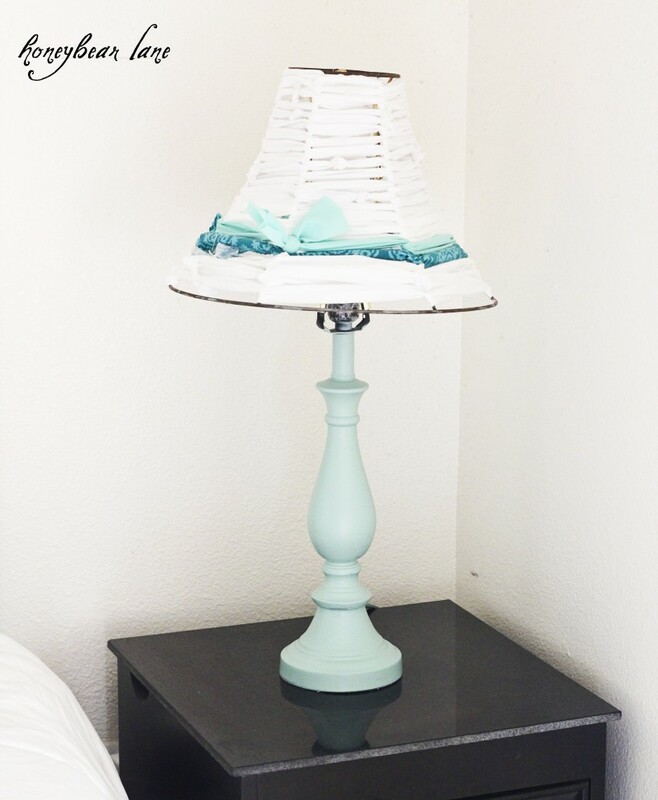 I spray painted the lamp base in my favorite aqua color. It was kinda hard, I’m not gonna lie. I’m not the master of spray paint. I’m too impatient. But more on that later…on a future lamp makeover post that I’m SUPER excited about. 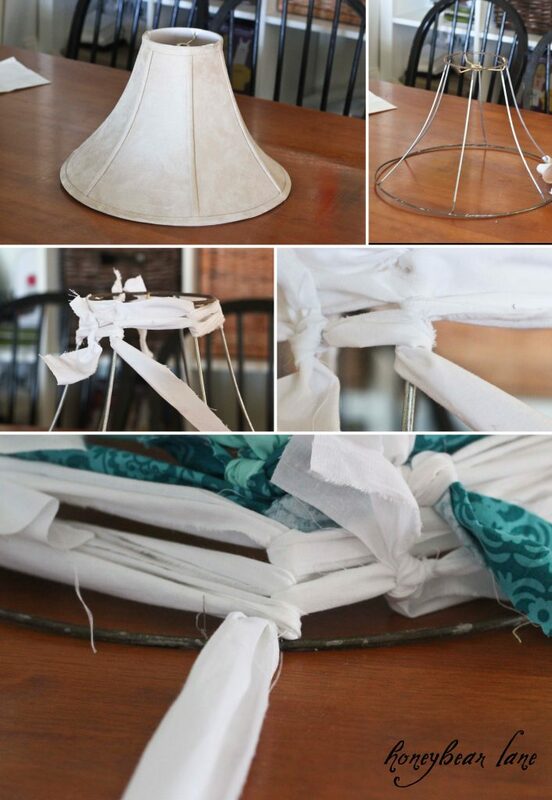 Here’s how you make this lampshade. Strips of fabric in your colors of choice. To start, strip the shade down to the wire. The take your strips and tie one end on. Then just start wrapping the strips around the wires, like shown. When your strip is running out, tie on another one. It’s that easy! And to mix in colors, just tie in the different color. And tie it to finish. I trimmed up the ties except for on the colors because I liked the bow. My Hub said it looked like a hat. If I were to do this again, I would either make knots at each post or at one designated post that would be facing the wall. But that’s me. I love it! and I especially love the little pop of color! Gorgeous!!!! Oooo. Now you have me thinking. I agree with the less obvious knots.. but hey it’s still amazing. This would be so cute done in rainbow colors for a kid room! I love rainbow colors that aren’t annoying. I can’t wait to play with this. 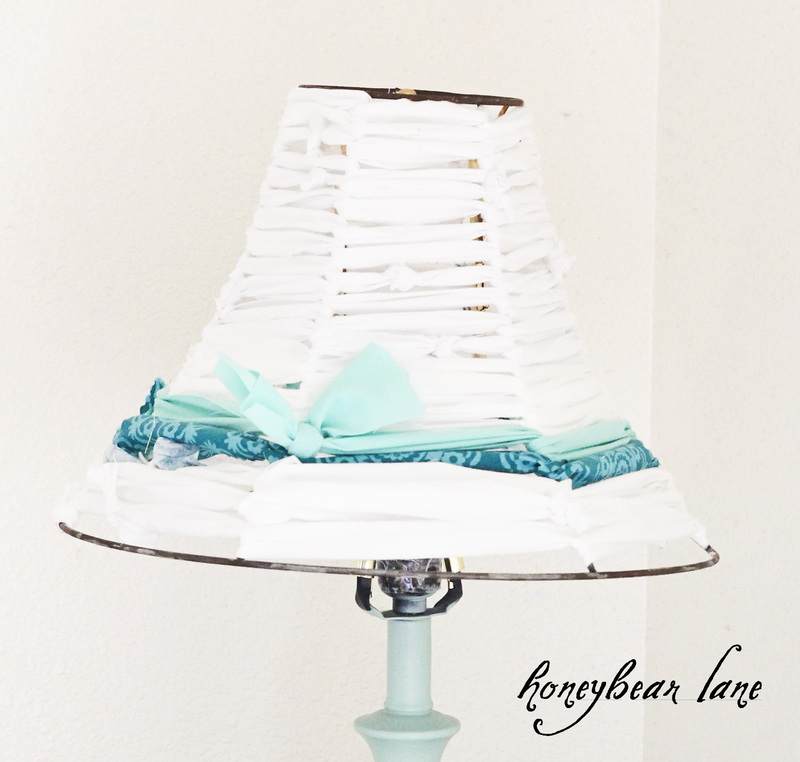 Yes, it’s a great kids room accent!